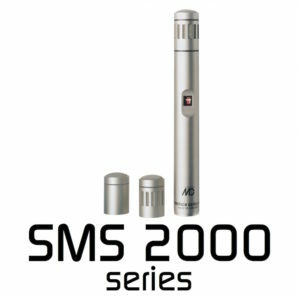 SMS 2000 comprises a microphone amplifier with interchangeable capsules for universal application in professional recording. 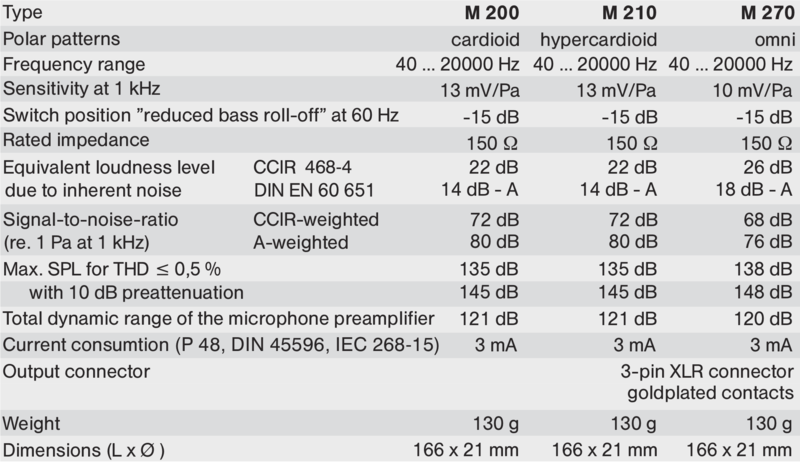 These are supplied as the following main assemblies, with additional capsules as required: M200 (cardioid), M210 (hypercardioid), M270 (omnidirectional). This allows universal applications in professional recording and sound reinforcement. The amplifier is fitted with a 10 dB attenuator switch, and a low frequency roll-off switch to reduce proximity effect when close miking. The newly developed, transformerless circuit design substitutes the previous transformer for a symmetrical output stage. The pre-amplifier is distinguished by its remarkably low intrinsic noise and output capabilities. The module system adjusted to optimum reproduction properties allows a particularly clean and colourless sound reproduction. The direction of maximum sensitivity is axial. The studio microphone module system is equipped with a comprehensive range of accessories for widely varying methods of microphone mounting. 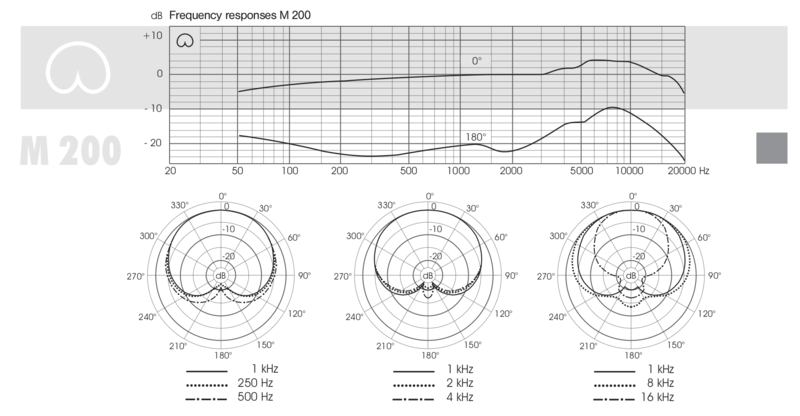 It is possible to activate a 10 dB preattenuation for handling very high sound pressure levels. 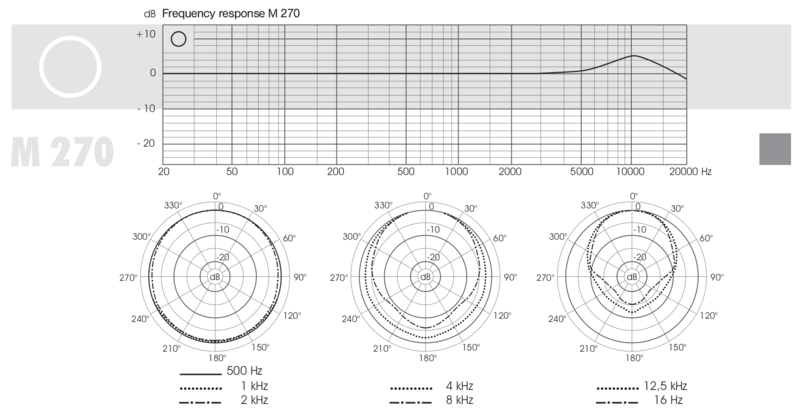 A sensitivity reduction for low frequencies can be utilized to suppress the proximity effect. The two switches are sunk into the middle of the microphone. The microphones are equipped with a standard 3-pin XLR connector fitting to a microphone cable, e.g. C 70. The operation voltage is provided by 48 V phantom powering according to the international standards DIN 45596 and IEC 268-15. The studio microphone system is available in a satin nickel or a black matt finish. The microphone capsule M 20 (used in the M 200 microphone) is a pressure gradient transducer with cardioid polar pattern which has well-balanced frequency contours in relation to the sound incidence direction and a desirable smooth presence boost in the upper range. These properties of the capsule preserve the natural accentuation of soloists and instruments when recording. It is recommended to use a popscreen for close- range applications and to switch the bass roll-off on the preamplifier on. 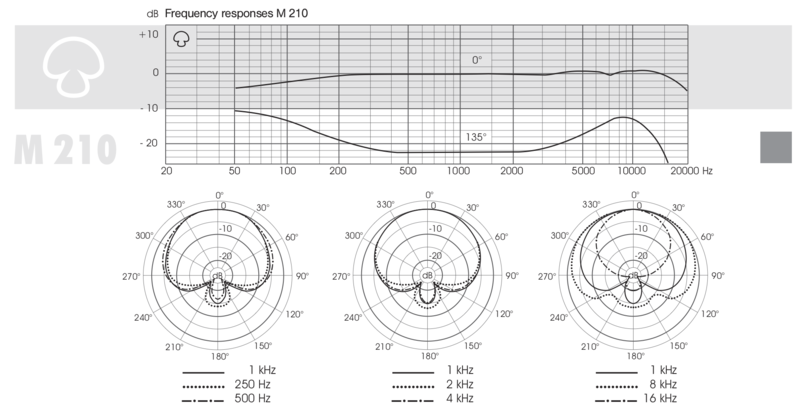 The pressure gradient transducer M 21 (used in the M 210 microphone) has a hyper-cardioid polar pattern causes a strong ”focussing” of sound in the front half-space and a suppression of crosstalk. The microphone capsule should be used for applications requiring special protection of front-impinging sounds against surrounding noise. The pressure transducer M 27 (used in the M 270 microphone) with omnidirectional polar pattern is mainly intended for far-field applications. It is insensitive to structure-born noise and wind. The presence boost of 5 dB at 10 kHz is also a warranty for brilliant recordings coming from undefined directions. There is an optional knuckle-joint that can be attached between the body and microphone head to aid in directing the microphone (EG: the body can be hidden underneath a table with only tyhe head showing). The M 2000 series microphones can also be used as a Boundary Microphone by using a “TURTLE” – for information on the TURTLE see HERE.